The moon is the closest planet to Earth. It moves with us in a sacred dance that unfolds in even, rhythmic cycles mirroring the cycles of the body, the cycles of the harvest and growth of plants and trees, the cycles of life. We can honor and celebrate the connection by monitoring as the moon waxes from new to crescent to quarter to gibbous to full and wanes through these phases in reverse back to new. Try meditating with a focus on any of the words associated with the current moon phase at your center. It is pretty common to begin with the new moon when working with it’s energy. The sky is dark, making this time as a clean slate. Set your intention for the upcoming cycle. It’s time to begin projects, start new regimes, and make a fresh start. Affirmation: I set my intention. I feel my intention in my body. As the moon waxes from new to full it passes through several phases. During the waxing crescent phases, take initiative in your intentions. It's time to deepen your resolve. Affirmation: I relax into my intention. I breathe. The Moon reaches the first quarter seven days after the New Moon. Take actions and steps toward your intention as the moon continues to grow. Affirmation: I take discerning action to support my intention. During the waxing gibbous moon phases it is time to refine and improve the intentions you set when the Moon was new. Affirmation: I trust that the perfect intention is coming to me at the perfect time. The lunar energies peak at the full moon, fourteen days into the cycle. The Full Moon provides us with clarity. Culminate! Let realizations come to you. It is harvest time, possibly for projects begun at a New Moon months beforehand. Affirmation: I move ahead with my intention. Give thanks for what you have gained as the moon begins to wane and energies and thoughts turn inwards. The Waning Gibbous phases are a great time to reflect and store up. Affirmation: I feel grateful that my intention is forming as I receive it. At the last quarter moon think about your projects or the direction you are following. This is a good time to use what you have learned and bide your time. Express new found truths. Affirmation: Now that I am receiving, I give back from a place of abundance. The waning crescent moon phases are a good time to work with what you have, and make it better. It’s not a good time to go after anything new, but a great time to polish up your skills and make things work out. Anything you don’t need, or which isn’t working can be recycled or thrown out now. Start thinking about your intentions and begin preparing for the next cycle. Affirmation: I reflect with thanks. I rest. I restore. Now we’ve come full circle, back to the new moon, the start of the next circle. Keep in mind, some intentions may take longer than one moon cycle to manifest. You may have multiple projects going at the same time with varying time frames. Be patient. It's easy to tell when the moon is full or new, but what about when the moon is waxing or waning? You can use an almanac like the Farmer's Almanac or one of Llewellyn's many digital almanacs. It's often listed in the newspaper in the weather section, or you could search the internet. But maybe you want to impress people at parties. You can tell whether the moon is waxing or waning by the time it rises. If the moon rises in the daytime, then it is waxing. If it rises at night, then it is waning. Another way to tell whether the moon is waxing or waning is to look at the fullest edge. If it is toward the east, the moon is waxing, or growing toward the full moon. If the fullest edge is to the west, then the moon is waning to the new moon. Note: If you're on the southern hemisphere, this would be the exact opposite. 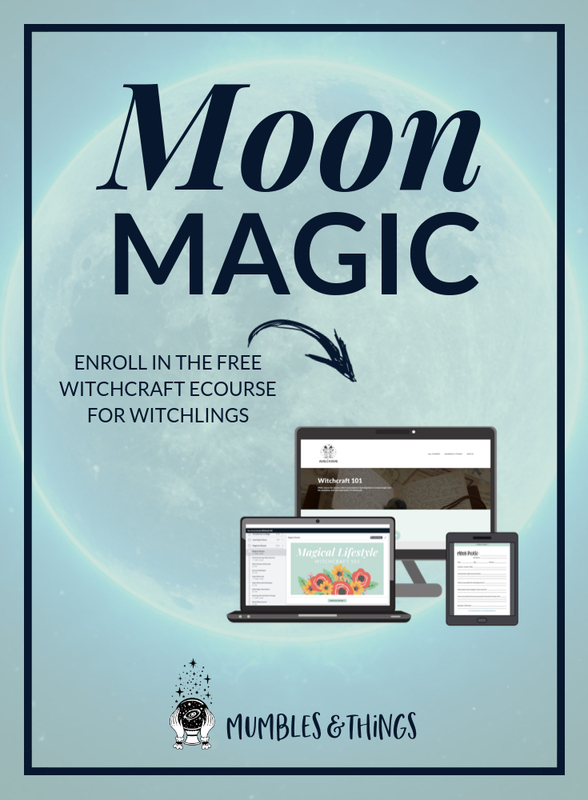 If you think you'd like to time your magic based upon the phase of the moon—here are some tips on what sort of magic to perform during the various lunar stages. Reducing things, such as debt, illness, etc. MARCH (September): Seed Moon, Worm Moon, Crow Moon, Sugar Moon, Sap Moon—Start a new project, a new job or family activity. Teach yourself a new skill. Choose which plants you'll grow in your garden this year. APRIL (October): Mating Moon, Hare Moon, Egg Moon, Fish Moon, Pink Moon, Waking Moon—Focus on your partner, review your behavior and what you can adjust in your activities that will satisfy yourself and bring harmony to your partner. Start planting your garden after the last frost. MAY (November): Dyad Moon, Journey Moon, Flower Moon, Hare Moon—Try getting all those errands done that you've been putting off. Take several short weekend or day trips. Visit places you've never been. JUNE (December): Mother's Moon, Mead Moon, Strawberry Moon, Honey Moon, Rose Moon—Take care of your female friends and family. Decorate your altar to honor the mother. JULY (January): Father's Moon, Thunder Moon, Mead Moon, Hay Moon, Buck Moon—Take care of your male friends and family. Decorate your altar to honor the father. AUGUST (February): Nesting Moon, Barley Moo, Grain Moon, Red Moon, Corn Moon, Dog Moon—Prepare for winter. Look over your winter clothes and replace or repair anything that no longer serves you. Mend or sew blankets, hang heavier curtains, heat treat windows and doors. SEPTEMBER (March): Harvest Moon, Wine Moon, Corn Moon—Tie up large projects with a sure completion by November. OCTOBER (April): Blood Moon, Sorting Moon, Culling Moon—Sort through and clear out your storage areas, kitchen cupboards and closets. NOVEMBER (May): Snow Moon, Death Moon, Frost Moon, Beaver's Moon—Remove any negative energy from your home. Compost dead houseplants, remove or repair broken furniture and objects, throw out or repair torn carpets and curtains. Declutter your space, find a home for or toss magazines, books, papers, clothing on the floor and under the bed, etc. DECEMBER (June): Dark Moon, Birth Moon, Oak Moon, Cold Moon, Long Nights Moon—Take advantage of holiday bargains. Go through your next calendar and mark off important dates, magical times. Block off time for specific projects. To help you keep track of the moon and how it effects your life, I recommend keeping a moon journal. 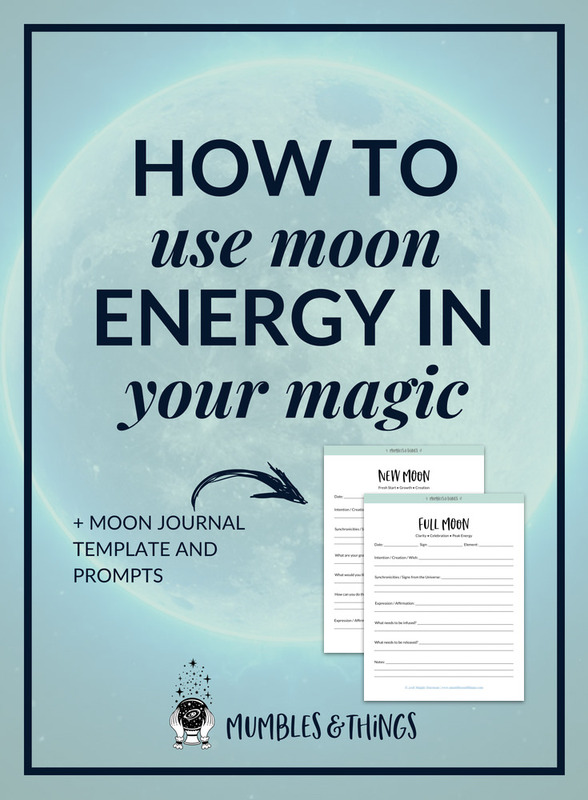 This practice is useful whether you are new to working with the moon's energy, or not. Make a habit to write in it every day around the same time. Mark the phase of the moon that day and be sure to include any strong emotions you are feeling and whether you participated in any magical or spiritual practice. You may need some guidance as far as how you'd want to set up your own moon journal. If that is the case, make sure you click the button below to sign up for my newsletter. Once you enter your information there will be a link to download the .pdf file. From there you can save it to your computer or print it out. Did I miss anything? Tell me how you work with the energy of the moon in the comments section below or share on the Mumbles & Things Facebook page.